Christmas has come and gone. For some people, Christmas was a joyful time spent with family and friends. But for others, the joy of Christmas may have been overshadowed by how expensive and stressful the last few weeks of the year were. Last-minute shopping may have caused you to run around trying to find something — anything! — for that relative you forgot. Then of course, you needed a card and wrapping paper, not to mention having to buy fresh food at the last minute so it wouldn’t spoil. And because of all the last-minute additions to your to-do list, you had to run to the nearest store to buy whatever you needed instead of going somewhere cheaper. If this sounds familiar, there’s a good chance you’re hoping to be just a bit more organized next year and save just a bit more money than you did this year. 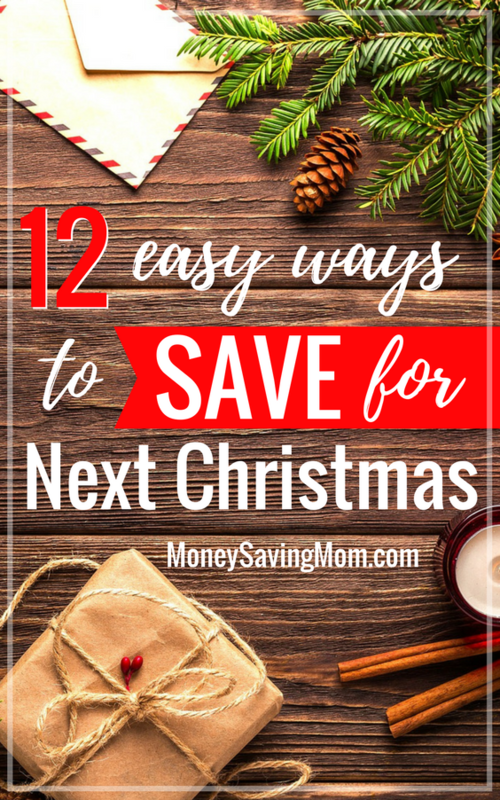 Well, you’ve come to the right place — here are 12 super easy ways you can start saving for next Christmas, right now. 1. Buy discounted wrapping paper. Gift wrapping is an inevitable part of Christmas time, so the paper will come in handy every year. Also, if you buy plain wrapping paper or neutral colors, you can use the wrapping paper throughout the year for different occasions. It’s a double win. 2. Buy discounted Christmas cards. Or buy discounted craft supplies to make your own cards next year. You don’t have to go crazy with fancy handmade cards, it’s the thought that counts. 3. Purchase stocking stuffers now. Products like socks, stationery, novelty items don’t expire, so buying cheaper products in advance is well worth it if you have the storage space. Many stores and banks offer loyalty programs, or even frequent flyer programs, and allow you to earn points throughout the year without even trying. Ideally, by the time next Christmas rolls around you would’ve earned enough points to redeem gift card to save a little bit of extra cash. 5. Start your Christmas fund now. Yes, now! If you save $1 a day for a whole year, you’ll have over $350 (or more!) in cash to spend next Christmas. There’s no doubt that money will come in handy when you need it most. 6. Shop sales throughout the year. It might seem a bit early, but if you have a list on paper, you can buy things when they’re really cheap, saving time, money and stress during the pre-Christmas rush period. 7. Use Santa Sacks to wrap kid’s gifts. If you don’t already use them, buy Santa sacks for your children’s presents instead of wrapping paper. Not only will you save money on gift wrapping that will only get thrown away, but you’ll reduce waste and start a lifelong tradition that your kids will cherish. 8. Stock up on non-perishable foods. Buy packaged food for Christmas gift hampers or Christmas nibbles that don’t expire until the following year. The only issue with this is making sure the food doesn’t get eaten before next Christmas! 9. Start learning a craft for homemade presents. This may not be for everyone, but if you’ve been thinking about taking up a new hobby, or if you spent this Christmas admiring DIY presents on Pinterest, then now is the time to start practicing. 10. Start selling unwanted items. There’s a good chance you have a post-Christmas mess you need to clean up, so this is the perfect opportunity to do so. Funnel the money into a Christmas fund for next year and you’ll thank yourself when the time comes to spend it. 11. Recycle gift wrapping and ribbons. Gift bags, gift boxes, or ribbons that have minimal damage are great to put aside and re-use next year. This might not appeal to everyone, but if you (or your kids) received way too many gifts, the same gift twice, or something you’ll never use, you might be better off re-gifting it instead of it gathering dust in the closet. For anyone else who likes to be organized and save in advance, what are your top Christmas saving tips? Michelle Savignano lives in Sydney, Australia, with her husband and two boys under 3. She writes about faith, family, food and finances. When she’s not spending time with her family, you can find her tweeting at @mvsavs or blogging at . « Sanity Savers for Moms ebook is free for a limited time! I shop the January and July toy sales. I just got my 5 year old son a $79.99 Lego set for only $24.00 because it was on clearance! I also check at rummage sales and thrift stores, as you can find new or nearly new art, craft, toy and book items there. My kids are still at the ages where they don’t mind if they get a gently used item. All good ideas. Last week I bought boxes of Christmas cards for $1 each at our local Christian store. I have also made simple drawstring bags from fabric that can be used from year to year for larger children’s gifts. I have also done this in birthday fabric as well. My favorite way to save for Christmas is to stockpile my Target gift cards. Target offers many ways to get $5, $10, and even $20 gift cards for buying certain items in their ads. We stay very disciplined and don’t spend money we don’t have just to earn the gift cards, but throughout last year we purchased diapers, detergent, and paper products strategically so that we could get the gift cards. And boy did they add up! We had over $200 in gift cards alone! Not an in advance tip, but I recommend checking the Dollar Store (Dollar Tree) for boxed Christmas card sets. I found a boxed set (12) Christmas cards there in season, and I was surprised at the quality. It was gold-embossed, very beautiful Didn’t look like anything you can get for $1! Good list! We have our Christmas fund built into our monthly budget, so every month money gets automatically deposited into a separate account. It takes so much stress away from holiday spending! I like to shop early. Also, I keep a gift idea lost going all year round for the people we always shop for. I’m terrible at coming up with ideas on the fly! If our sweet King Jesus only recieved 3 presents why should we expect more? I’ve often heard of the three present rule: Something they need (clothing etc) something they want (toys etc), something that will educate or having meaning (books or what have you) Just an idea. WE do the Christmas Club and it works out well for us, and we don’t go over the bdget, and that money is for all the presents in the familiy including grandparents etc. We have to make it work for everyone. We also don’t buy presents for extended family. We’ve all agreed that our presence together around Christmas is presents enough. Have have loads of fun together without gifts under the tree. Chris, Some banks have what’s called a Christmas Club Account. In my area, Bancorp South has this. It is a savings account you can put money into and then the first week of December, the bank cuts you a check for however much is in your account. It is the only way we can afford to do Christmas each year. It helps me to save money and not really miss it, and then come early December, I get a nice Christmas Club check, and we go Christmas shopping with that money and no shopping on the credit card, and no debt! A win win for us! I think now is the time to start conversations with family/ friends about next year’s expectations. Hey, instead of gifts for everyone, let’s draw names. Or: Let’s try and do experience gifts or spend $50 per family or whatever agreeable accommodations can be made ahead of time when no one is rushed. Great tip to start making the homemade gifts now. I always have big ideas for making homemade gifts and then end up not having enough time before Christmas! Honestly, we have cut back from how we used to “do” Christmas, which has helped in both easing the budget and in shifting from the entitlement trap to a little more focus on the reason for the season. There are some good tips in this article and I’m glad to see that I’m already doing a few of them. I’ve cut way back on what I buy for the extended family, so that helps, and my husband and I don’t exchange, because we pretty much get what we want ourselves all year anyway. I do like buying for my children, though, but I try to shop early and shop sales and clearance, and only then if it’s something they can actually use, not just junk that will clutter up their rooms. My main problem now is the things that are more so out of my control. Like the electric bill– it was more than double the usual bill. Or the extra groceries I need for the company that comes every year. And the groceries I need to put on the Christmas Day dinner (which I enjoy doing but wish it didn’t have to be every year). I kept track this year, and even with shopping the sales and using coupons, I spent $450 on groceries for company/Christmas day. Every year I try to skimp and save on groceries and I’m still feeling the burn. Another great way to earn money for Christmas is to download an use the Ibotta ap. They offer rebates on groceries, online shopping, beer, wine, etc. It’s a great way to earn money back for products you are already buying. They give you your first $10 at sign up, and only have to have a minimum of $20 to cash out. They can send it to your paypal or request a gift card from a large selection of places. I’ve been using since end of August and have made $290 already. It sure came in handy for Christmas.